The Wooleator socks bring a new level of warmth to Defeet's popular Aireator design. Merino wool construction offers the great moisture transfer and incredible insulation that sheep have been taking advantage of for years. Soft and comfortable with the perfect combination of warmth and ventilation for the frigid winter or hot summer. Made in the U.S.A.
comfortable, soft and just wool enough. 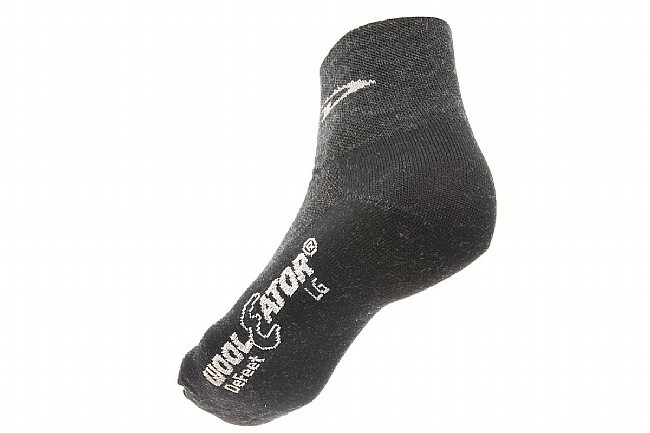 these DeFeet wooleator socks are thin enough not to be to much to fit into a tight rode cycling shoe, they are perfect for riding in all kinds of weather, wool is still the warmest when wet. Worst pair of cycling socks I ever purchased, period. After one use they completely lost their shape, got all lumpy and after washing them, they were even worse, straight to the trash. I love merino wool socks as they normally retain their shape well and keep my feet comfortable, but I will stay away from this brand in the future. Back to the tried and true Giro socks. Great sock - wool is the best!! Good fit, great materials and good price. Have not had them long enough to estimate longevity, but others have worked out well. The best thing about Defeet socks is they last a long time. 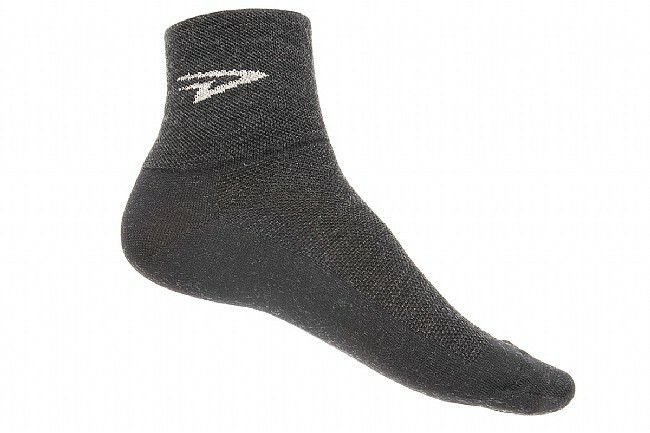 Unlike the smartwool socks I have tried in the past which wear out after 20 - 30x, Defeet last years. Yea, the Defeets are not 100% wool but my feet like them and wearing them 100% has eliminated the nasty athletes foot I had for years. This song keeps my feet warm in 40 plus weather. anything colder requires shoe covers. I just rode the Rockwell relay in 99 heat with the socks and my feet did not overheat. they are quite comfortable and not too thick yet not too thin. The lettering on the sock has never been an issue. I now own three pair. These are the best socks I've had for road cycling and I've tried a number of brands. wear these all the time, on the bike and off. like everything, and have not found anything to gripe about. Best 4 season sock ever! Great any time of year! Durable and comfortable. Wool has great properties keeping you warm in the winter even when wet, and these Marino wool socks are really soft and comfortable and surprisingly durable which makes them an excellent value as well. Great for running or cycling. My new favorite socks. These socks are comfortable, keep my feet dry in all temperatures, and are durable. I have one pair Ibhave been wearing for several yearsso long Im not sure when I bought them. These are a little thicker than my Pearl Izumi wool socks. Wool socks are pretty much all I wear nowon and off the bike. Best warm socks for cold, wet winter riding. I purchased these socks for the first time a few years ago as stocking suffers for my husband and sons. We are all avid cyclists and try not to let the cold, wet Seattle winters keep us down. They were a hit. I've purchased them every year for their stockings. They wear like iron and are sized generously for the size 11-12 feet of the guys. I don't think they expect these socks in their stocking every year! I like these wool socks and own 6 pairs. I find them comfortable to wear for recreation and general use. I've been wearing heavy duty wool socks in the winter for several years now. It wasn't until recently when a friend of mine suggested wool socks for the rest of the year that I thought I'd try some lighter weight wool socks. The reviews for the Wooleators were good so I made them my first summer merino wool socks. I'm so glad I did because these socks are cooler than my synthetics and keep my feet dryer than cotton does. They are very durable as well. I ride, walk, work, do everything in these socks. Good socks are very important to me. Your feet deserve the best care you can give them. These socks certainly fit the bill. I'll buy more in the future. Best riding socks I have ever owned. Soft, warm and comfortable. I bought two pair last month, and I love 'em. Smooth, soft, itch free wool is the ticket. Buy ten pair !! These are not bulky so my feet don't feel cramped in my riding shoes wearing them. They are warm without being itchy. Great price, will be buying more. Wear these for all my riding but primarily for touring. Feels great, cushions my feet on SPD's,warm when wet, very comfartible. This is the thin version of their wool socks. (Thicker version is Woolie Boolies) Very comfortable, not itchy, keeps your feet warm in the cold and not too hot when it's warm.